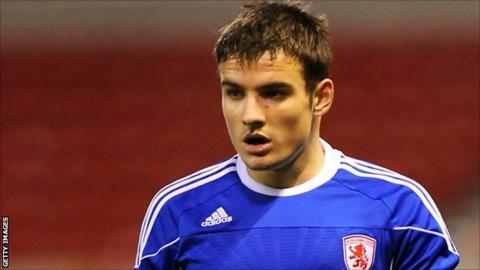 Middlesbrough manager Aitor Karanka has said defender David Atkinson will not be rushed into first-team action, but is in his plans for a debut. Academy product Atkinson, 20, has been on the bench for the last eight Championship matches but is yet to make his professional bow for Boro. Injuries and suspension have left Karanka short of numbers, but Boro next travel to promotion hopefuls Burnley. "It's a good opportunity, but I must protect him," Karanka told BBC Tees. "We're playing against Burnley and it will be a difficult game, after he could be [affected for the] worse. "If not this Saturday, hopefully he can play before the end of the end of the season. "He's trained with me every day very well and he deserves to play."